4,661 NeoPixel Ceiling LED with RaspberryPi @Raspberry_Pi #PiDay #RaspberryPi « Adafruit Industries – Makers, hackers, artists, designers and engineers! 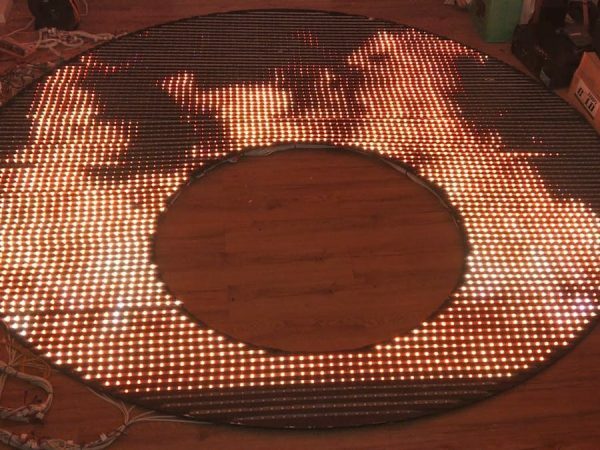 This project consists of a ceiling mount consisting of 4,661 NeoPixel LEDs powered by a multiple 5V power supply, 10 Fadecandy NeoPixel driver boards and a Raspberry Pi 3 Model B+. This LED ceiling mount is capable of playing videos, and displaying colors as selected on the color picker. A web-based mobile application is developed, so that the users can select the videos or the color, that is to be displayed in the ceiling mount display. The data is sent from the users browser to the the LED ceiling mount over WiFi to the Raspberry pi hosting ROSWWW server. We’ve used ROS framework on this project, to manage multiple nodes and establish communication between Raspberry Pi and the web application. Our project included a polywood frame, in a circular shape with a hollow circle close to the bottom of the frame. The frame was designed in such a way it fits into the Plaster of Paris layer on the ceiling. The fitting is done using large mounting screws directly into the concrete layer. We used flexible NeoPixel strips of 30 LEDs/m. Since, the shape of the frame is circular, placing a whole strip of LED is not a feasible option. We applied some simple mathematical formula to generate a file that would help us determine the amount of LED required in each strip cut.